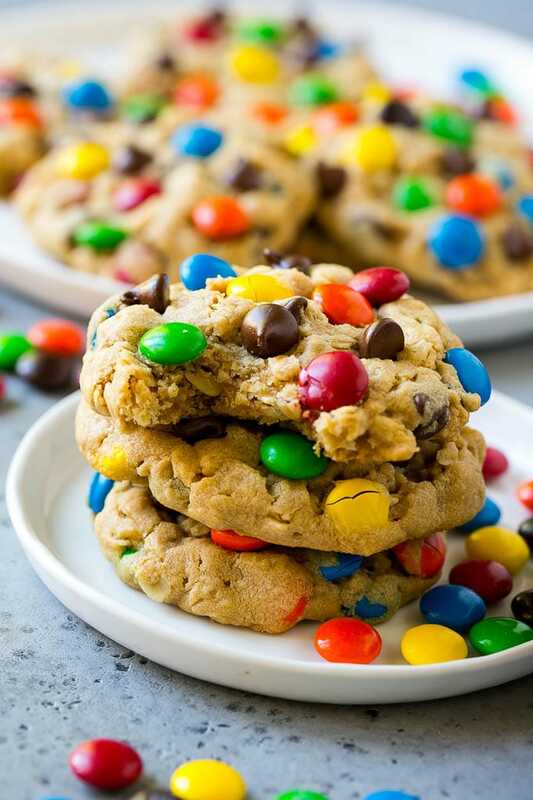 These monster cookies are soft and chewy peanut butter oatmeal cookies loaded with chocolate chips and M&M’s. An easy and classic cookie that’s perfect for parties, after school snacks and special occasions. There’s nothing better than a good cookie, and these loaded monster cookies definitely fit the bill. They’re packed with tons of chocolate, oatmeal and peanut butter and are adored by both kids and adults alike. I happen to love monster cookies, they’re all of my favorite cookie flavors rolled up into one hand held treat! These monster cookies are the best I’ve ever had. I find that some monster cookies tend to be dry or hard, and my version comes out perfectly soft and chewy every time. 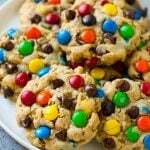 How do you make monster cookies? This recipe starts out like any other cookie recipe with butter, flour, and sugar. Oats and peanut butter are added into the mix to make a thick cookie dough, and then the add-ins get folded in. The dough gets spooned onto a baking sheet and is ready to go into the oven. I like to press some extra M&M’s and chocolate chips into the tops of my cookie dough balls because then they look prettier when they come out of the oven. These cookies don’t spread much, which means you’ll end up with a thick and chewy cookie without a hint of dryness. The cookie dough can be stored in the fridge for up to 3 days before baking. 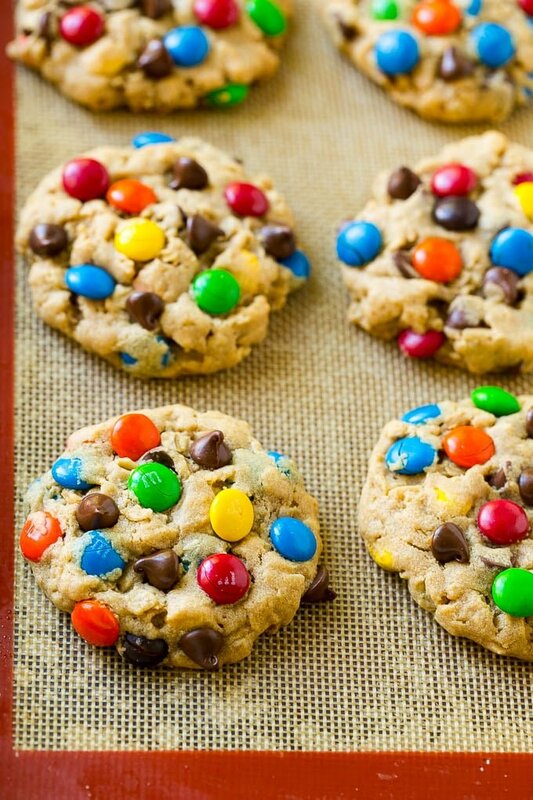 If you’re planning to make your dough ahead of time, you may want to omit the M&M’s and add them just before baking so that the color from the candies doesn’t stain the dough if it’s in the fridge for a while. These cookies freeze beautifully. Place them in a single layer in a resealable freezer bag, then freeze until solid. Let the cookies sit at room temperature to thaw. 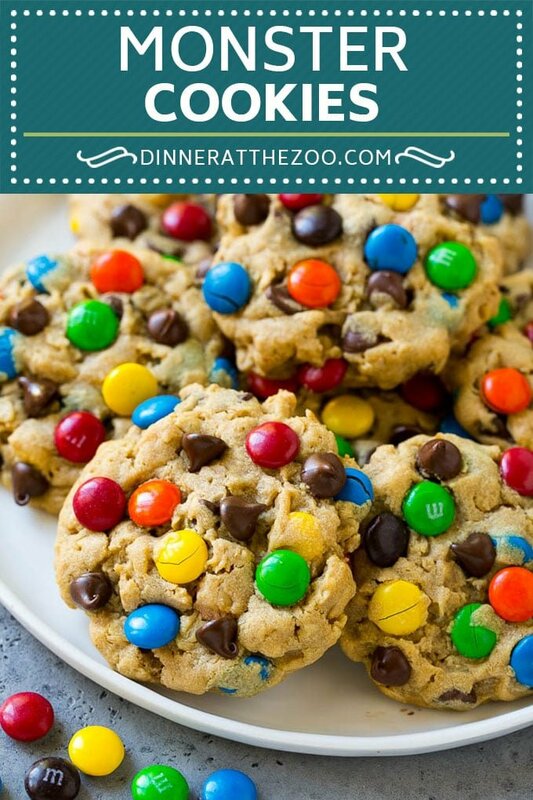 My kids request these monster cookies all the time, and I can’t blame them. Between the soft flavorful cookie and tons of chocolate, how could anyone resist? 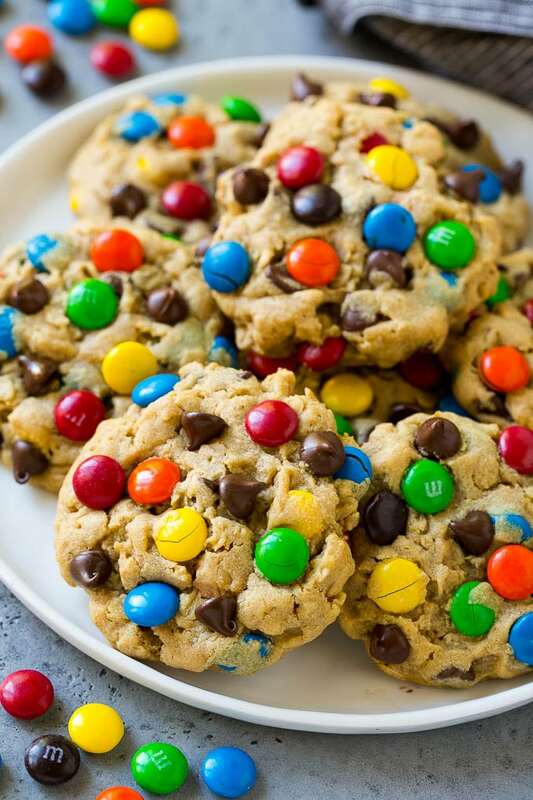 These monster cookies are soft and chewy peanut butter oatmeal cookies loaded with chocolate chips and M&M's. An easy and classic cookie that's perfect for parties, after school snacks and special occasions. Line a sheet pan with a piece of parchment paper or silicon baking mat. Place the butter, brown sugar, and granulated sugar in the bowl of a mixer. Beat until light and fluffy, 1-2 minutes. Add the egg, peanut butter and vanilla to the bowl and mix until combined. Add the flour and baking soda to the bowl and mix until just combined. Stir in the oats. 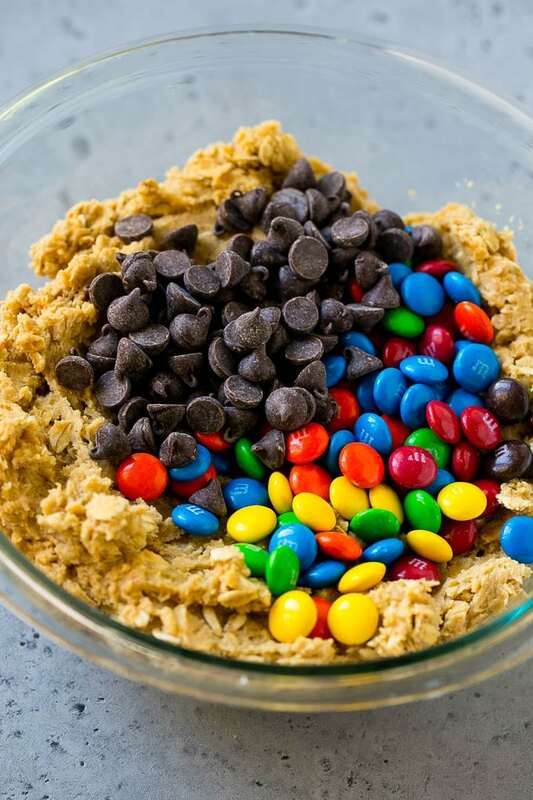 Add the M&M's and chocolate chips to the bowl and gently fold them into the dough. Make 2 tablespoon sized balls of cookie dough and place them 2 inches apart on the prepared sheet pan. You will need to bake the cookies in batches. 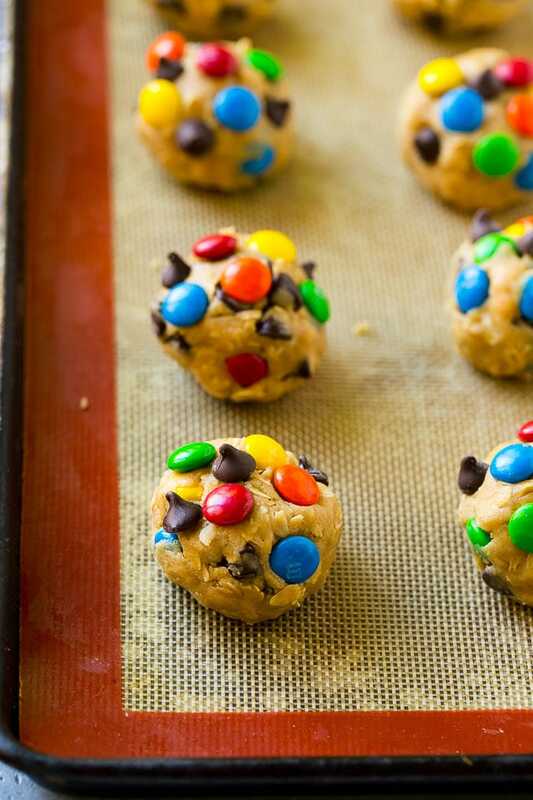 Press a few M&M's and chocolate chips onto the top of each cookie dough ball. Bake for 11-13 minutes or until edges are lightly browned. Cool the cookies on the pan for 5 minutes, then transfer to a cooling rack. Repeat the process with the remaining cookie dough. Cool all cookies completely then serve. Store any leftover cookies in a sealed container for up to 5 days, or you can freeze the cookies for up to 2 months. Adapted from Live Well Bake Often. This post was originally sponsored by Capri Sun. 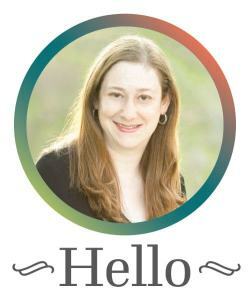 This post was originally published on April 28, 2016 and was updated on February 5, 2019 with new content. Any suggestions on what the sub for the peanut butter would be appreciated! Sunflower butter is a great alternative, it’s nut free! Monster cookies is where it’s at! I love them. So filled with special sweets for my sweet tooth. I am craving for some sweet treat and this is perfect time to come across your post. Looks really yummy! Holy crap. This sounds like every cookie goodness, all in one! This sure looks yummy and delicious, will definitely a great hit with kids. Such a ingenuity to come up with this kind of recipe, especially the shape of the cookies that’s like a meat ball. I loved it.